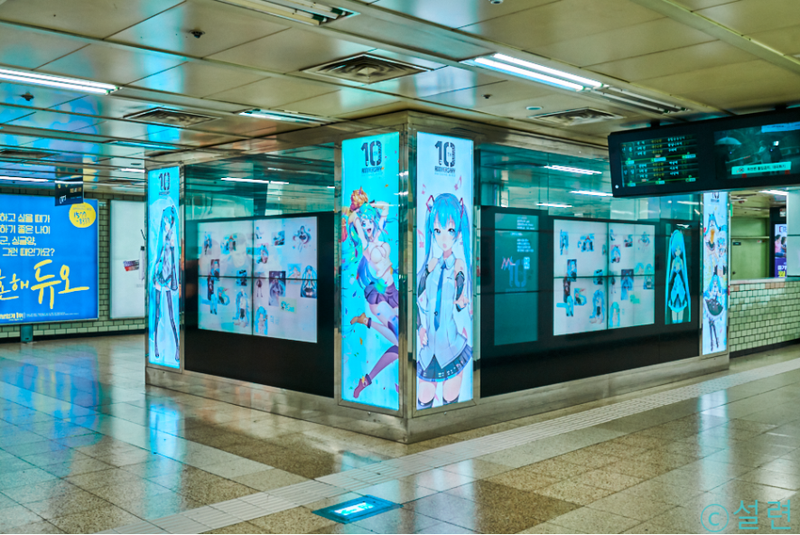 Last year, a group of South Korean Hatsune Miku fans crowdfunded a billboard dedicated to the digital diva. This year, they’re back, and this time they’ve crowdfunded what looks like a shrine to the virtual idol. According to tipster Sang, fans raised about $4,000 on Kickstarter and another $37,000 (yes, $37,000!) on crowdfunding site Tumblbug for a huge birthday display at Samseong Station, one of the biggest in South Korea. As of today, Hatsune Miku is ten years old. Can you believe it? Running ads are expensive in this train station for companies, let alone a group of fans. Blogger Sul Lyun, who participated in the funding, went to the station to check out the end result, which is a mixture of video and original art. Backers have their name proudly listed on the display, which is supposed to celebrate and advertise ten years of Hatsune Miku, but it looks more like a shrine! The display of diehard fan love will be up for a month.